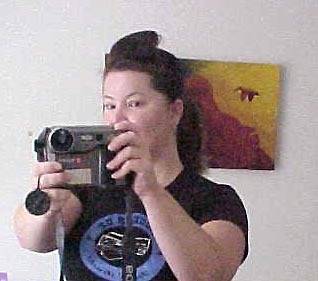 Posted September 30th, 2003 by Ms. Jen & filed under art + photography. Anne Galloway’s blog [purse lip square jaw] has a new design and it is completely gorgeous! Posted September 30th, 2003 by Ms. Jen & filed under fun stuff. About once a week, I like to try a new hairdo. Lucky always has the best and most inventive ‘dos for long hair. She has one she does frequently with a roll in the front and the back in curls or in a ponytail. I have tried to recreate it twice now with varying rates of success; last week’s attempt looked like a wedding hairdo gone wrong and today’s attempt looks like a chola ‘do from the front and a psycho “V” from the front/side. Sigh. Posted September 29th, 2003 by Ms. Jen & filed under ideas + opinions. Tonight, when I got home from my annual early fall pilgrimmage to the Eastern High Sierra for hiking & leaf peeping, I boiled some potatoes for a late supper. After 20 mins. of cooking, I needed to lift the lid and check on the little Dutch Yellows, but the lid handle was too hot. I reached for the nearest kitchen towel, lifted the lid with the towel, checked the potatoes and determined that they needed more time in the pot. I put the lid back down, put the kitchen towel down, and returned to the section of the LA Times I was reading. I smelled burning. I saw sparks. The kitchen towel was on fire and trying to set the wood chopping board on fire. I flung the flamming towel onto the floor and used the throw rug to stamp out the fire. Once everything was under control, I started to yell. My roommate came into the kitchen, saw the half charred kitchen towel, the floor rug with char marks, and the singed chopping board. She remarked that I should have used the pot holders next to the stove, as they are 5 by 5 inch squares that would not get near the burner as I lifted the lid. This may be true, but I usually only remember to use the potholders when I open the oven and need to get items in or out or move them around. When I am cooking on the stove, I don’t think of a pot holder, I use the nearest kitchen towel. I may need to rethink this strategy, as I have just lost my favorite towel. Posted September 25th, 2003 by Ms. Jen & filed under fun stuff. French activist Thierry Meyssan, president of the Paris-based Reseau Voltaire group, is not content to re-write history or at least be a good conspiracy theorist with incendiary books, but his think tank has released a highly amusing deck of playing cards that highlights the 52 Most Dangerous US Government Officials. The Reseau Voltaire website has a pdf of all 52 cards in English. 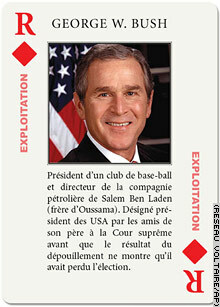 The deck features two Jokers: Osama and the Weapons of Mass Destruction, Rumsfield is the Ace of Spades, The Puppet Master (D. Cheney) as the Ace of Diamonds, and as the King of Diamonds…..
George W. Bush – Head of a baseball club and director of Salem bin Laden’s oil company (brother of Osama). Designated President of the United States by friends of his father at the Supreme Court before the vote count showed that he lost the elections. Monseir Meyssan missed all the lovely Team 100 folk who made the Bush Dynasty possible…. 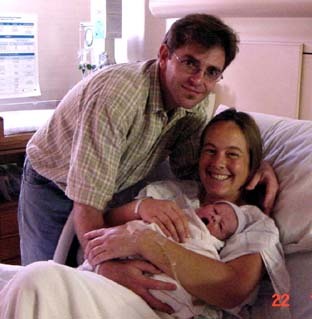 Nathan David Hocking was born into the Hocking Household on Monday, September 22nd 2003, at 1:02 pm. He weighed 7 lbs 4 oz, and measured 20-1/2 inches. Mother and Baby are doing fine, and Ariana is ecstatic! Big Congratulations to the Hocking Family!!! Posted September 24th, 2003 by Ms. Jen & filed under art + photography. I still need to put together the photos from the Briefs, the Epoxies and the Pervs show from last Sunday and the Lucky Stars show on Friday. I do apologize for the photo quality on the Black Flag photos, but I was pressed into service by Alex with only a disposable camera on hand. 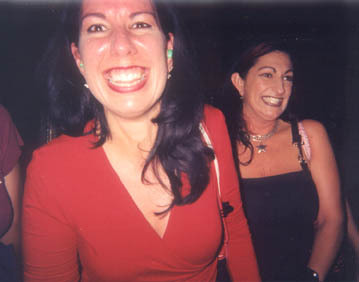 Posted September 22nd, 2003 by Ms. Jen & filed under fun stuff. My new made up word for the day: Turtlerific! Turtlerific \tert-‘l-‘rif-ik\ adj, a sub-set of American English, California dialect circa 2003, 1. better than terrific due to having turtles involved. Posted September 22nd, 2003 by Ms. Jen & filed under ideas + opinions. Lots of people like to claim that there are no seasons in Southern California. These are usually people who grew up in places with four traditional seasons, and SoCal is a wee bit too subtle for them. As a native of the place, I would like to assert that we here in SoCal have 3 to 6 seasons depending on how subtle you would like to get. Sun – This season happens frequently and can be cool and bright or warm and bright or hot and bright depending on the time of year. Rain – This season usually happens November – April and is interspersed with Sun. Inversion – This season usually happens in late spring/early summer and again in late summer/early fall. The Inversion season occurs when the Pacific Ocean is cold and the desert is hot, thus the middle region (first fifty miles between ocean and desert) is either foggy, smoggy, hazy or all three at once, as the competing air temps duke it out up against the mountains. This is the season that baffles visitors and non-natives the most. Winter: November through February – this season includes Rain and Sun. The temps can drop down in the 60s in the daytime, causing all sorts of folks in flip flops and tank tops to whine extensively about how FREEZING IT IS. Very funny time of year. Also one of the most beautiful times of the year when the mountains are draped in white and it is 72 degrees at the beach. Spring: February through April – this season also includes Rain and Sun, with some Santa Ana winds. Warm, fertile, snow on mountains, everything blooming, and strawberries in season. June Gloom: May through June (sometimes into July) – this season is the Inversion time – fog and low clouds roll in and either roll out at noon or stay all day. People get grumpy, esp. my mom. Summer: July through August – this season is SUN. Can be nice and warm with a good ocean breeze or just plain hot. Smog: September through October – this season is the late summer version of June Gloom combined with heat & humidity from Mexican hurricane season. This is the season that gets the most complaints out of me. Most likely time of year to have 105 degrees, 100056% humidity, and air that is nearly solid. Yuck! Fall: October through early December – like fall in many other places just a bit more subtle and warmer. The leaves are more likely to turn brown-red or brown-yellow than a pure red or yellow. Usually sunny, can include inversion or rain and a good Santa Ana wind or two or three.